… Is what Stylish wrote in big block letters across her calendar for last weekend. She is organized and actually keeps track of things like that on her calendar. I know, it’s a little creepy. So, jackets. We planned to make these last year. How did that not happen, I ask you? Don’t answer. Anyway. Stylish had her pattern picked and fabric bought this time last year. Simplicity 2508 in a giant houndstooth check. 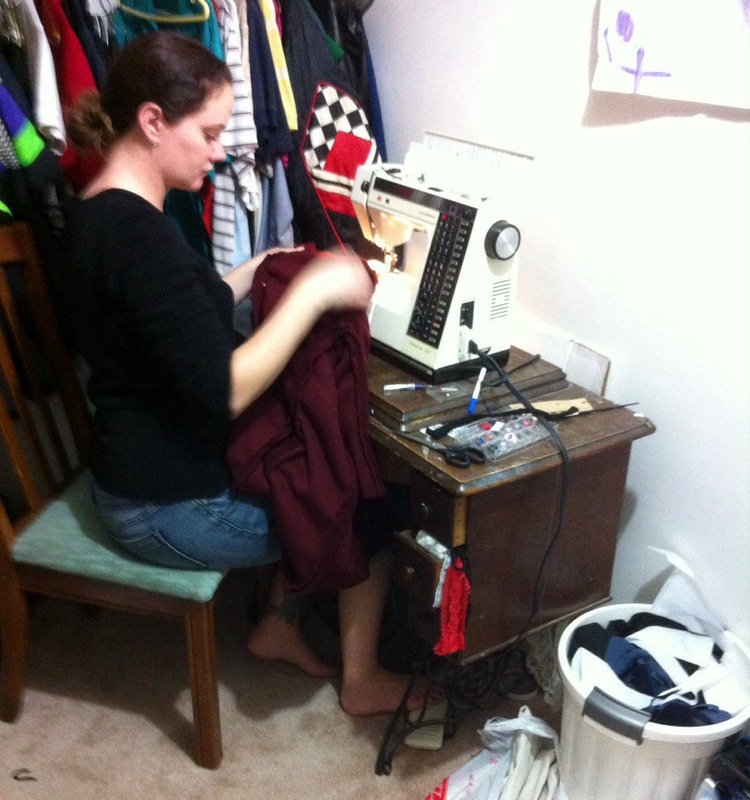 Keep in mind this time last year she’d only made one garment, and I did the zipper for her. Ok, maybe a bit of working up to it was in order. Anybody remember this pattern? Of So, Zo fame? That I muslined aeons ago? That I found the perfect fabric for and have been sitting on ever since? Well, it’s cut now. I’m commited. I probably should’ve done another muslin to check my changes on the bodice, but there’s enough fabric left to re-cut it if I have to. But I’ve decided I need a windproof underlining for this wool (which is actually a knit) so I have to go pick up something thin and nylon-y. I’m making the loooooong view, A. Did you need to ask? Oh, and it’s really long. According to the pattern envelope, 57″ from the nape of the neck. I checked and even with the shortened bodice on mine, that’s still brushing the ground on me, and I’m 5′ 7″. It’s going to be AWESOME. My Crafty sister-in-law came, too, but I didn’t get any photos (Stylish’s basement is many things, but photogenic is not really one of its talents). She’s making the same pattern as Stylish. Actually, the same view. It was really handy because she could just go down the list of pattern pieces Stylish had made and trace out the ones she needed in her size (that pattern is not the most clearly-labeled when it comes to figuring out which pattern pieces you need for which views, by the way.) Her fabric is a houndstooth, too, now that I think about it, although very different in style and scale, and she’s aiming for a fall coat, not the full winter deal. If anyone has any thoughts on FBA’ing this pattern, I’d love to hear them. Stylish got her muslin, made in a sweater knit, almost done (still needs collar and cuffs). We had made a couple of adjustments to the pattern beforehand—she traced the size 12, grading out to a 14-equivalent below the waist, and add about 2″ to the sleeves (more may be needed), and then shortened the torso by 2″. Figuring that out for the raglan sleeves was kind of brain-wracking, and I’m still not entirely sure I got it right. Let’s just say I’m very glad I walked those raglan sleeve seams after I’d done all the alterations, because it took some serious fiddling to get them to line up. (Which makes me wonder if they matched in the original pattern, but that’s a whole ‘nother issue.) All those changes were worth it, though, because when she put the coat on the waist was in exactly the right place, there was enough room for her hips (not any extra, mind you) and the sleeves were, well, almost long enough. All we did was tweak the shoulder width a wee bit, easy to do with a raglan (narrowing them), and taking in at the back a little bit. I was trying very, very hard not to take it in too much, at least on the pattern. The “muslin” may have a future life as a sweater (or perhaps a housecoat :P) for which it would be more flattering to take it in a bit more. The next step is going to get a bit scary, though. 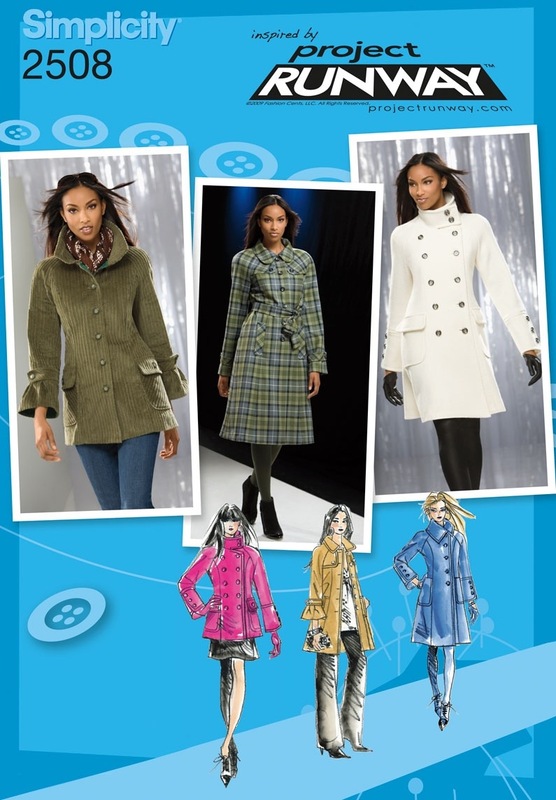 The Simplicity coat doesn’t have separate pattern pieces for things like the lining and interfacing. I know how to adapt those pieces (thank you Sherry!) but how heavy duty do I want to get here? I don’t want to overwhelm either of them, but I also don’t want them to spend all this time and money on inferior jackets. 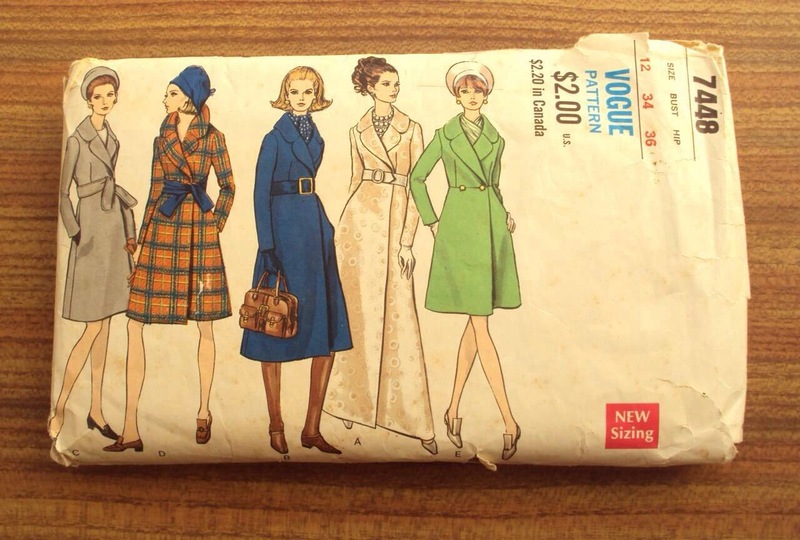 And how do I break it to Stylish, for sure, that she’s going to have to do bound buttonholes on her fabric? Machine-stitched ones are SO not going to happen on her thick, spongy fabric. Crafty MIGHT be able to manage machine buttonholes, but that can be even more of a headache than bound buttonholes. /sigh. 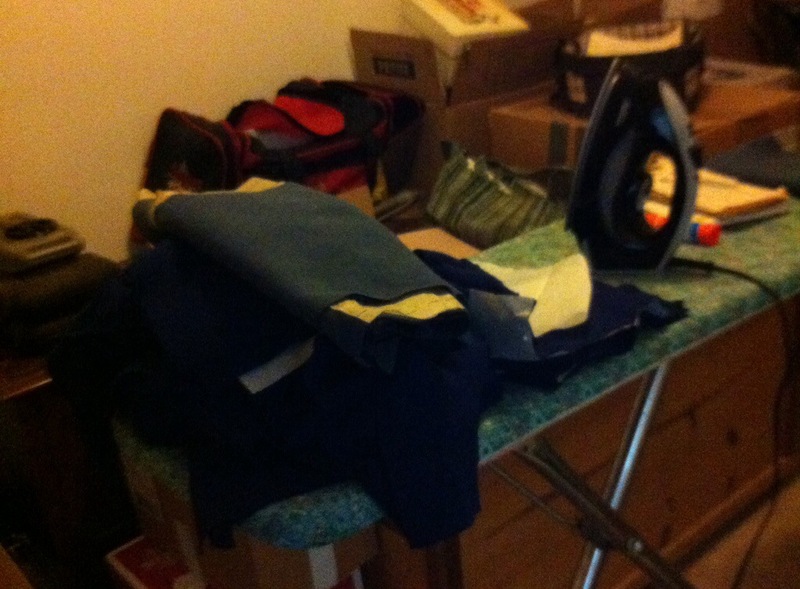 I want to say that more Jacket Makings will be happening this weekend but, well, it’s the weekend before Hallowe’en. 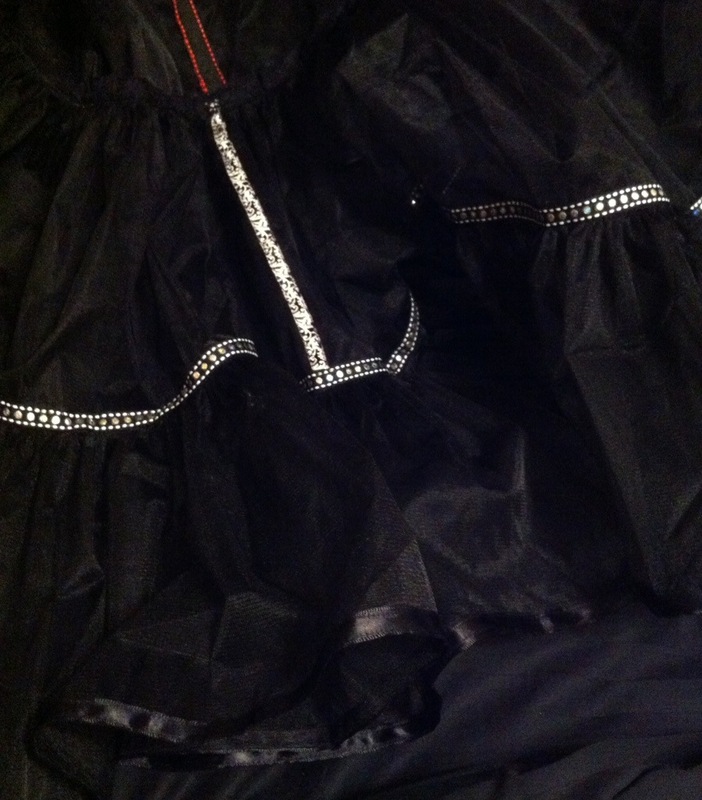 Both kids have costumes that need to be put together (if not exactly sewn) and I have a black crinoline to finish. On the other hand, winter is definitely in the air over here. I really, really, really want a crazy-warm, long, heavy coat. Good luck with coat making! Perhaps as there’s 3 of you sewing together it’ll bring you all good luck :)? I do hope you fitted those jackets over a complete set of whatever underpinnings you/they plan to wear beneath, like, say, a shirt and sweater, and not over just a bra..it’s easy to forget that a COAT is intended to do JUST THAT: go “over” clothes!. I love that Project Runway coat, especially that high collar! Oh, and don’t forget to Scotchgard the bottom of that loooong coat; it’s bound to catch a lot of sloppy slush and you might as well forestall the inevitable!! I love your floor length coat pattern – that sounds amazing, especially now that it’s chillin’ up here 🙂 Wherever did you get your wool? I can’t find ANY decent coating here this year!! I actually made the white version of Simplicity 2508 jacket last year, only in the shorter length. The lining was not as troublesome as you may think. I also did a FBA. I did the adjustment on the side piece, not the front, and spread it as close to the front seam line as possible. Does that make sense? I also did bound buttonholes for all of the functional buttons. Totally worth it. If you would like, I would be happy to take some pictures and/or provide more detailed explanations of things I may have tweaked a little bit. Can’t wait to see the results!